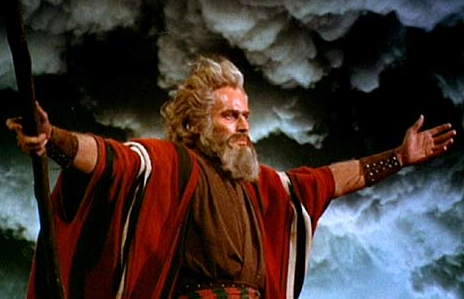 Moses (Charlton Heston) parts the Red Sea during the Exodus. Note: Some good people, including friends of mine, will most likely disagree with what I write here. I mean no disrespect to them or to their beliefs. This article examines the Bible in terms of verifiable historical fact and mainstream scholarly opinion, not to promote any religious or anti-religious viewpoint. As always, dissents and factual corrections are welcome. In our time, many people of Europe and North America are almost completely ignorant of the Bible. They see it either as irrelevant to their lives or as a pernicious collection of primitive fables and supernatural myths. That’s unfortunate, because it’s impossible to understand Western civilization without knowing about the Bible and being familiar with its contents. That applies to believers and non-believers alike. In almost every area of life — in religion, literature, politics, painting, music, even in psychology — Western civilization is influenced by the Bible. From Shakespeare to Freud, from social justice to the rule of law, Western civilization either follows Biblical ideas or disputes them. If you’re ignorant of the Bible, then in a very real sense, you don’t know yourself or your own society. This blog article will explain the basics of what the Bible is, how it developed, and who wrote it. It will also discuss, though not systematically, some of what the Bible says. Although it’s not the main subject of this blog article, the content of the Bible is even more important than how it was written, edited, and compiled. First, the Bible contains important truths about our lives, our world, and our Creator. Though the Bible’s transcription by fallible human beings communicates those truths inconsistently, and sometimes in primitive terms, the truths are still there to be found. Second, as noted previously, much of Western history consists of conflicts about what the Bible means and of attempts to implement its precepts. Western philosophy, art, music, and literature virtually overflow with references to Bible stories and verses. If you don’t know the Bible, you can’t understand any of that. Christians refer to the canonical books about Jesus and Christianity as the “New Testament.” They refer to the Hebrew Bible as the “Old Testament” because of their belief that the New Testament supersedes it. Similarly, Muslims believe that the Qur’an supersedes both the Old and New Testaments. Mormons believe the same thing about the Book of Mormon. “Testament” means a solemn contract, in this case between either the Jewish people and God (the Old Testament) or between Christians and God (the New Testament). I will sometimes use those terms, but without the theological implications. The authors of the various books of the Bible did not call it “The Bible.” In fact, they worked separately and did not know that their writings would later be collected into a single volume. Our name for the Bible comes from the Greek ta biblia, which means “the books.” The Bible is a collection of books composed over many centuries by many different authors and editors. The books of the Tanak (what Christians call the “Old Testament”) and of the New Testament were collected separately and were written in different languages: Hebrew for the Old Testament, Greek for the New Testament. Most of the Bible’s content originated as oral tradition and was written down only later. Once written down, the books of the Bible were copied and re-copied by hand over the centuries, leading to errors of various kinds. (The printing press wasn’t invented until the 15th century.) In the 19th century, two kinds of “Biblical criticism” emerged. Lower criticism tries to determine how closely our current texts of the Bible match the original texts. None of the original texts still exist. Our oldest texts are hand-written copies, most of which date from the Middle Ages. Those copies were made from earlier copies, made from still earlier copies. At each stage, copying errors changed the text slightly. Sometimes, the changes were trivial; other times, they were important. For example, the oldest text we have of the New Testament is a small fragment from the Gospel according to John that scholars believe was made about 125 CE. In 1707, an Oxford University Biblical scholar named John Mill studied 100 manuscripts from the Middle Ages and found 30,000 discrepancies between them. Of the 5,000 or so ancient and Medieval Bible texts we have, no two are exactly alike. The story in John 8:3-11 of Jesus and the woman accused of adultery does not appear in the earliest copies of that Gospel, so Biblical scholars think it was added later. If you imagine yourself as the copyist, it’s not hard to see how that could happen. You’d heard that story about Jesus, but it’s not found in the Gospels. It has a good moral point, and it certainly sounds like something Jesus would have done. So you assume that it’s true, and with the best intentions in the world, you add it to the text. Likewise, the earliest copies of Mark end at verse 16:8, when the women see the risen Jesus but are so frightened that they don’t tell anyone about it. The final 12 verses, in which Mary Magdalene tells the disciples that Jesus is alive, and then Jesus appears to them, seem to have been added later on. The copyist most likely “completed the story” by filling in events that he was sure were true but which weren’t in the text before him. When all we have are copies of copies of copies, made over the centuries, it’s not easy to know what the original texts said. Lower criticism tries to determine that. Higher criticism compares the Bible’s descriptions of events to other historical and archaeological evidence. The goal is to determine when the events occurred and how accurate the Bible was in describing those events. For example, independent historical evidence suggests that the exodus might not have occurred exactly as described in the Book of Exodus: it might have taken more time, involved fewer people, and so forth. Likewise, Luke 2:4 states that Joseph and Mary went to Bethlehem because everyone in the Roman Empire had to return to his ancestral home for a census. Such a census would have required a huge migration of people across the Roman Empire, but there is no non-Biblical record that it took place. Matthew does not mention the census, and simply has Joseph and Mary living in Bethlehem when Jesus is born. Therefore, Biblical scholars and historians doubt that the census described in Luke actually happened. Higher criticism often upsets people because it assumes that there are errors in the Bible: not merely copying errors, but factual errors in the original texts. Such people believe that to admit errors of any kind in the Bible is to deny its Divine inspiration or even to question the existence of God. I think that this view is mistaken. Unless God Himself wrote the books of the Bible with His own hand, they passed through the hands of human writers and copyists who could make mistakes. They were often based on oral traditions that had been told, re-told, and embellished at each re-telling. To say that these accounts contain historical errors implies nothing about the accuracy of the moral and spiritual message they carry. If ancient historians knew that the Greeks fought the Persians at a particular place and time, and the Greeks won, that was good enough. The details were incidental and could be made up in the interest of telling a good story. When the Greek historian Herodotus (484 – 425 BCE) writes that Croesus said, “Do not always act on the passionate impulse of youth,” he doesn’t mean to imply that anyone was transcribing what Croesus said; nor would it bother him if Croesus said nothing of the kind. As a historian, Herodotus was not worried about whether this or that detail was correct; he was telling a bigger story. The same applies to Biblical writers. To antiquity we grant the indulgence of making the origins more impressive by co-mingling the human with the divine. My wish is that each reader will pay the closest attention to the following: how men lived, what their moral principles were; then let him follow in his mind how, as discipline broke down bit by bit, morality at first foundered; how it next subsided, then began to topple headlong in ruin until the advent of our current age, in which we can neither endure our vices nor the remedies needed to cure them. This is not history as we think of it in the 21st century: objective, dry reporting of facts. Herodotus makes up some of the details in his story. Livy offers a mixture of fact, legend, and moral preachment, “co-mingling the human with the divine:” exactly what we find in the Bible. In the Bible, consider Psalm 19 or Jesus’ Sermon on the Mount. Do their exact location, timing, or wording have anything to do with their transparent moral and spiritual truth? Of course not. So why worry about those things? In most cases, we do not know who originated or wrote down the books of the Bible. The books of the Jewish Bible contain oral traditions passed down through the generations of the ancient Jews. Many of the traditions are similar to those of other Middle Eastern cultures of that time. The Biblical story of Noah, for example, includes some passages that closely match passages in the Sumerian epic of Gilgamesh. The stories of Moses and Joseph have parallels to the story of Sargon. As infants, both Sargon and Moses were found in baskets floating down the river; as adults, both Sargon and Joseph interpreted dreams for the king. The Jewish Bible was compiled from earlier documents some time after the Babylonian exile in the sixth century BCE. The books of the Christian Bible contain oral traditions about the life and ministry of Jesus, theological and moral preachments, accounts of the early Christian church, and an apocalyptic vision attributed to John. The books of the New Testament were written between 20 and 65 years after Jesus’ death by people who had probably never seen him. They were not written in Aramaic, which was the language of Jesus and his disciples, but in Greek, which was spoken by educated people in the Roman Empire. Apart from the 13 epistles of Paul, seven of which are believed actually to have been written by Paul, we don’t know who wrote the books of the Christian Bible. Most people also don’t realize that the decisions about which books to include in the Jewish and Christian Bibles came relatively late. Many documents were considered scriptural by some Jews and Christians but were excluded from the Canon. Even today, different versions of the Christian Bible are used by Catholic, Protestant, and Orthodox churches. Likewise, there are differences between versions of the Jewish Bible that follow the Masoretic text and those that follow the Septuagint. By the end of the first century CE, there was considerable agreement among Jewish groups on which books were scriptural, but the status of some books continued to be debated. The Christian canon — the choice of which books to include in the Christian Bible and which books to leave out — was decided in debates that lasted from the second to the fourth centuries CE. Many putative Gospels were excluded for various reasons, such as the Gospel of Peter and two different Gospels attributed to Thomas. An apocalyptic book attributed to Peter was excluded from the canon as well. The Law (Torah). Called the Pentateuch in Greek, this consists of the first five books of the Bible: Genesis, Exodus, Leviticus, Numbers, and Deuteronomy. It contains stories about the creation of the world and early interactions between God and the Jewish people. It also contains the commandments (mitzvot in Hebrew), of which the 10 Commandments (or 15, if you believe Mel Brooks) are the best known. By careful analysis of the text, Orthodox Jews find that there are actually 613 commandments: 365 “negative commandments” that forbid certain actions and 248 “positive commandments” that require certain actions. The Prophets (Nevi’im). This continues the historical account started in the Torah. The Writings (Ketuvim). These are miscellaneous writings, such as the Book of Psalms, that didn’t fit into other sections of the Bible. J: Scholars call this document “J” because in the Book of Genesis, it uses the most sacred name of God. When this name occurs in sacred texts, modern Jews substitute the Hebrew words Adonai (Lord), Elohim (God), or Ha Shem (the name). This document probably came from the Southern kingdom of Judea and embodied Judean oral traditions. E: This document is called “E” because in the Book of Genesis, it refers to God as Elohim. This document probably came from the northern kingdom. D: This document appears almost entirely in the Book of Deuteronomy and was written sometime in the 7th century BCE. P: This focuses on religious observance and rituals of primary interest to priests. It dates from the middle of the first millennium BCE. This account of the Torah’s origin is called the Documentary Hypothesis. Though it remains a hypothesis and cannot be conclusively proven, Biblical scholars think it best explains the content and history of the text. It explains, for example, why there are two creation stories in the first two chapters of Genesis. The first story ends at Genesis 2:3. The second story goes on for the rest of Genesis 2. Still canonical but of somewhat lesser status than the Torah are the Prophets and the Writings. The Prophets continues the history of the Jewish people, starting with God’s choice of Joshua to succeed Moses. In Jewish Bibles, this section contains eight books; Christians divide the same material differently to end up with 21 books. The Writings consists of sacred works that didn’t fit into the first two sections, including Psalms, Proverbs, and the Book of Job. Most people have at least heard quotations from Psalms and Proverbs. The Book of Job grapples with the fact that being a good person does not necessarily lead to a pleasant life: that misfortune can fall on the just and the unjust alike. A good contemporary meditation on that issue is Rabbi Harold Kushner’s book When Bad Things Happen to Good People, which I recommend. The Gospels. Attributed to but not written by Matthew, Mark, Luke, and John, these describe the life and ministry of Jesus. The Epistles. These are 21 letters written by Christian leaders to various churches they established in other cities. The Acts of the Apostles. Apparently written by the same author as the Gospel according to Luke, this describes the development of Christianity in the first century CE. The Apocalypse of John. Also known as the Book of Revelation, this presents the author’s metaphorical vision of a conflict between good and evil. As noted previously, the books of the New Testament were not written in Aramaic, the language of Jesus and his disciples. Instead, they were written in Greek, which was the language of educated people in the Roman Empire. Although the New Testament begins with the Gospels, the earliest Christian writings in the canon are the epistles of Paul, which scholars believe were composed beginning in 50 CE, about 20 years after the death of Jesus. The Gospels were written between 65 and 95 CE, with John’s Gospel coming last. The Book of Acts was written in the same time period as the Gospels, as was the Apocalypse of John. Matthew, Mark, and Luke are called the “synoptic Gospels” because they tell many of the same stories, often using the same words. Biblical scholars believe that Mark was composed first, around 60 to 65 CE. The authors of Matthew and Luke appear to have used it as one of their sources of information about Jesus. Though they tell roughly the same stories, Matthew and Luke differ on some points, such as why Joseph and Mary were in Bethlehem and what happened after Jesus’ birth. Mark starts with Jesus already an adult and does not mention his birth. Both Matthew and Luke give birth stories of Jesus, adding that he was born of a virgin. Paul’s epistles, written earlier than the Gospels, do not mention the virgin birth. Some early Christians, such as Marcion of Sinope and his followers, did not want to keep the Jewish scriptures as part of the Christian canon. Marcion thought that the God of the Jewish scriptures was stern, cruel, and judgmental. He taught that the God of the Jewish scriptures was a different god from the loving, forgiving God of Jesus. The author of Matthew, however, did want to keep the Jewish scriptures, so he translated the Hebrew word “almah” in Isaiah 7:14 as referring to a virgin, though “almah” in fact means “young woman” and there is a different Hebrew word for “virgin.” Thereby, he argued that the Jewish scriptures predicted the birth of Jesus. Other attempts to find Jewish scriptural predictions of Jesus’ birth and ministry were similarly strained. One thing of which most Christians are unaware is that the Jewish concept of the Messiah is different from the Greek concept of the Christ. The Jews thought of the Messiah as either a warrior-king or as a great teacher, not as a God who would come to earth and die for the sins of mankind. In the Jewish scriptures, the Hebrew word for Messiah (Moshiach) means “deliverer” and is also used to refer to Moses. Christian writers who were eager to find continuity between the Jewish and Christian scriptures blurred together the Jewish concept of the Messiah with the Christian concept of the Christ. The Gospel of John was written last, some time around 90 or 95 CE. It tells different stories about Jesus than the synoptic Gospels and is more theologically oriented. The Epistles are 21 books, each a letter from Paul or another church father, that provide guidance to Christians. Thirteen of the letters are nominally from Paul, though Biblical scholars believe only seven of them were actually written by Paul: Romans, First and Second Corinthians, Galatians, Philippians, First Thessalonians, and Philemon. Biblical scholars believe that the others, called “deutero-Pauline epistles,” were written by followers of Paul who attached his name to give the letters credibility. That was not an uncommon practice in ancient times. Most of the authentic Pauline epistles were written to address specific problems that Christians had encountered in churches that Paul had established. Paul’s epistle to the Romans gives more theological exposition. Galatians gives Paul’s response to Christians who believed that they had to convert to Judaism to be followers of Jesus. Interestingly, Paul mentions the birth of Jesus in Galatians 4:4, but says nothing about it being a virgin birth. This lends credence to the theory that the virgin birth story was added later on to Christian lore about Jesus, and was then embodied in the Gospels of Matthew and Luke. Paul has been called “the first Christian” because, it is said, he transformed Christianity from the religion of Jesus (a version of Judaism that emphasized love more than law) into a religion about Jesus (Christianity). Paul’s epistles were written around 50-60 CE, so they are the earliest Christian writings to be included in the New Testament. The Apocalypse of John, also known as the Book of Revelation, gives a metaphorical and poetic account of a battle between good and evil. Because it’s metaphorical, this book is hard to interpret. Evangelical Christians usually believe that it foretells the end of the world, the Anti-Christ, and what they call “the rapture,” in which faithful Christians will meet Jesus in the sky. That’s certainly one interpretation. Some Biblical scholars think that it refers instead to events in the writer’s own time: that the number “666” refers to the Roman emperor Nero because it’s the number of his name in Hebrew, and that the beast refers to Rome. But given the nature of the writing, many interpretations are possible. Whether you believe in its Divine inspiration or not, you should make a serious effort to become familiar with the Bible. Apart from its formative role in Western civilization, it contains insights, moral precepts, and spiritual encouragement that is unsurpassed in human religious literature. If you read your Bible and think about it what it says, you will not merely become better educated. You might also become a better person. Great stuff here as usual, N.S. Thanks for the insight. Thank you, George, for the nice comment!